Does Swarm Intelligence automatically Trigger Approach of the Second Sun win condition? Does Swarm Intelligence go infinite with twincasting spells? Would swarm intelligence trigger metallurgic summonings? 2nd Octopus from Swarm Intelligence? I actually made this one as a somewhat casual control deck that simply accrues increasing value over time if left unchecked. I was deliberately avoiding combos, though I have accidentally discovered an infinite turns combo- Swarm Intelligence + Mnemonic Wall + Aminatou, the Fateshifter + Time Warp . Tick up Aminatou, putting the turn spell on top to cast it with Yennet, doubled due to Swarm, first extra turn you tick down Aminatou to flicker the wall, getting back the turn spell, second extra turn you freecast it with Yennet again. 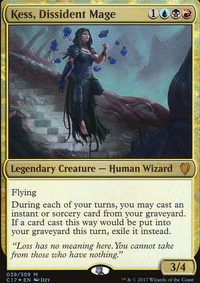 I'd rather not try to make the deck more competitive (by adding more fast mana) because I have other decks that fill that role, and because realistically Narset is the more competitive version of Yennet. think about adding Swarm Intelligence ? Scenario: Turnabout is in the graveyard. Regrowth is cast and copied through something like Swarm Intelligence . Turnabout is targeted. I'm not sure if the copy resolves first or the original spell, but whichever the case, can the Turnabout be cast while the second copy of Regrowth is still on the stack and be put back into the graveyard for the second Regrowth trigger? Or do both copies need to have valid targets first before either resolves? In simple terms? Can I cast Turnabout twice? First question: Because the exile effect of Possibility Storm is part of the resolution, but not a necessary part (i.e. it does not say "Exile that spell, if you do, then [insert effect here]). 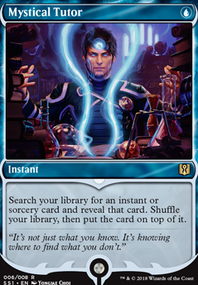 If Possibility Storm’s ability doesn’t exile the original spell (perhaps because another Possibility Storm already exiled it), you’ll still exile cards from the top of your library until you exile a card that shares a card type with it and have the opportunity to cast that spell. Second question: That was an error on my part. It seems all the different triggers floating about hurt my brain as well, and I mixed up Swarm Intelligence 's and Sunbird's Invocation 's triggers. Rightfully, it should say Swarm Intelligence will trigger off the spells cast by Eye of the Storm , while they will not trigger Sunbird's Invocation . Given only the cards you have named, I'm assuming you cast nothing relevant with the extra cast from the two Expertise spells. When you cast Decimate , Eye of the Storm , Sunbird's Invocation , Swarm Intelligence , Possibility Storm , and cascade all trigger at the same time because they all trigger from you casting the spell. You control all four triggers, so you can put them on the stack in whatever order you please, and that will change what happens next. Eye of the Storm will pull in Decimate , then copy that and the two Expertises and cast those copies in whatever order you choose. 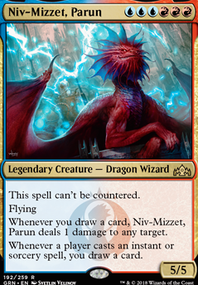 Sunbird's Invocation will reveal 4 cards from the top of your library, and you may cast one of them with CMC 4 or less without paying its mana cost. The rest go on the bottom of your library. The new spell will go on top of anything else on the stack. Swarm Intelligence copies Decimate . The copy is not cast. Possibility Storm exiles Decimate , then exiles cards from your library until you hit another Sorcery. You may cast it without paying for it, and then all the exiled cards (including Decimate ) go on the bottom of your library in a random order. 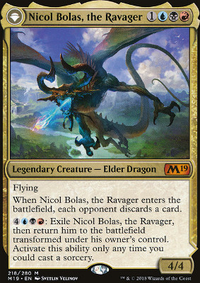 Cascade will exile cards off your library until you hit one with CMC 3 or less that isn't a land, and then you may cast that for free. This would go on top of anything else on the stack. It's important to note that Eye of the Storm , Sunbird's Invocation , and Possibility Storm look for you casting a card (Eye) or from hand (Sunbird and Possibility), so they won't look at copies, even ones cast from Eye. Eye of the Storm will trigger for the cascaded spell, the Sunbird spell, and the replacement spell from Possibility Storm if they are instants or sorceries. Sunbird's Invocation will trigger and resolve for the initial Decimate casting, but not for any other spells this whole mess adds to the stack since none of the rest are "from hand." Same with Possibility Storm . It doesn't matter if Eye ate the card that Possibility wants to exile; it will still resolve just fine. Swarm Intelligence will trigger from the spells copied and cast by Eye of the Storm . As mentioned, those copies won't trigger anything. Cascade will trigger for every spell you actually cast, which is all of them except Swarm Intelligence . Decimate will trigger it twice (initial cast, plus the copy from Eye of the storm). It's a big mess. A lot really depends on what order you want to put the triggers in. Thanks cdkime! I am still a little confused though. 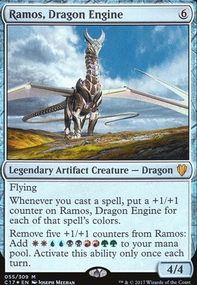 Why does Possibility Storm still resolve if Eye of the Storm has taken Decimate off the stack? Why does Eye of the Storm trigger Sunbird's Invocation when the cards are not cast from the hand? 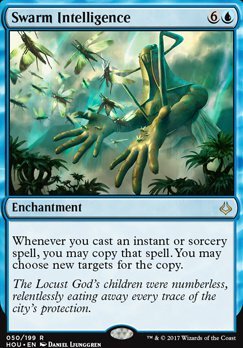 Related, why does Eye of the Storm not trigger Swarm Intelligence even though you are casting the copies? As the player who controls all these triggers, you get to decide what order they resolve in. 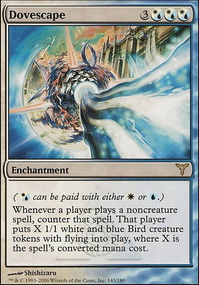 At the time of casting, you have Eye of the Storm , Sunbird's Invocation , Swarm Intelligence , Possibility Storm , and a Cascade trigger that you will have to determine the order of. That leaves you with 5! different ways you can order the stack on the trigger--a total of 120 different options. Rather than go through all those options, I will hit some highlights. Swarm Intelligence 's copies are not cast, so they will not implicate Eye of the Storm or Cascade. Posibility Storm still will activate, even if the spell has already been activated by Eye of the Storm . The cards cast with Eye of the Storm will trigger Sunbird's Invocation , but not Swarm Intelligence and Possibility Storm .